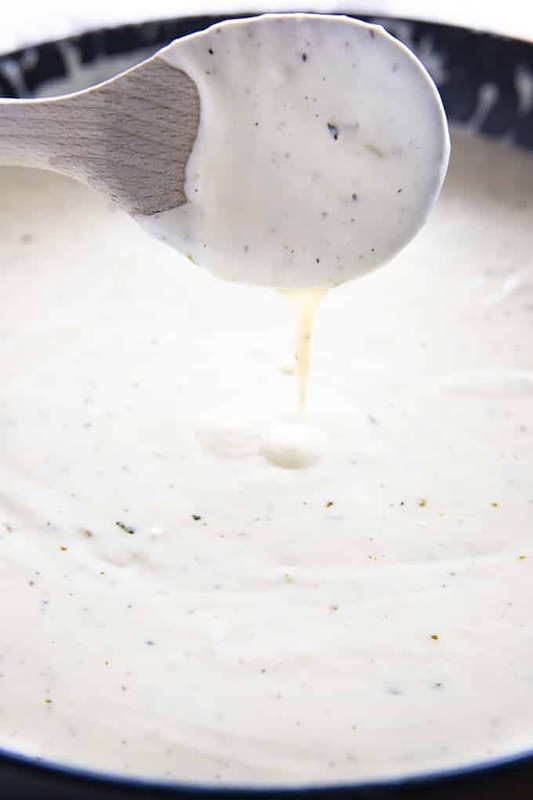 Best Homemade Alfredo Sauce is rich, creamy, and packed with garlic parmesan flavor! 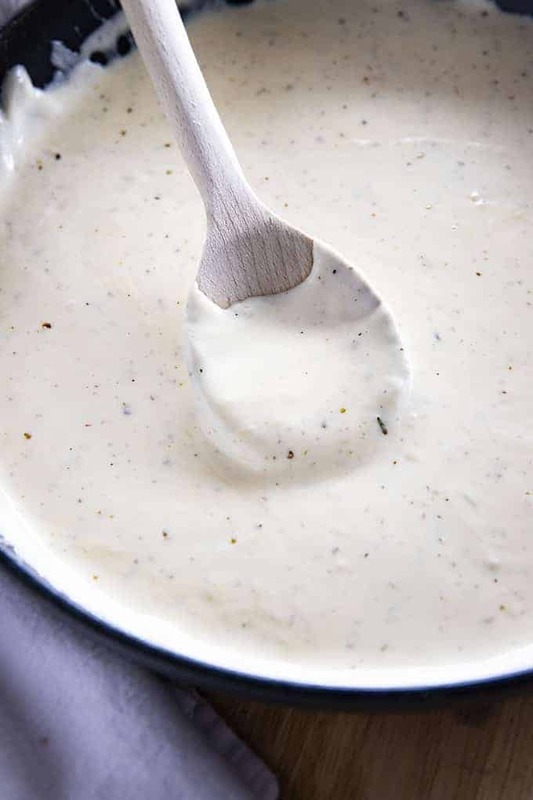 This Alfredo Sauce is easy to make and perfect with your favorite pasta! 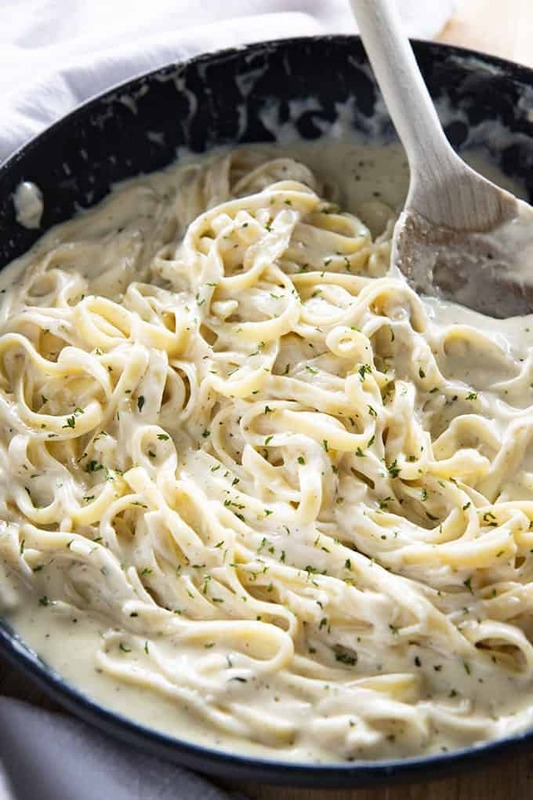 Alfredo sauce is one of my favorite things to have with a big bowl of pasta! It’s a very rich and indulgent treat for dinner. I also love that it only takes about 5-10 minutes to whip up a batch! This recipe will yield about two cups of sauce total. It can easily be doubled if you are feeding a crowd or want extra for later. The bottled Alfredo just doesn’t compare to this delicious homemade version! Traditional Alfredo sauce is a simple white/cream sauce. It is made from butter, heavy cream, and parmesan cheese. While the original style is great, I simply like to add garlic, salt, pepper, and Italian seasoning to make Alfredo sauce taste even better! Next, you will whisk in your garlic and seasonings. Whisking constantly for about one minute just to let the garlic cook. If you love making your own pasta sauce at home, be sure to try out my Easy Homemade Pesto as well! Add the butter and cream to a large skillet. Simmer over low heat for 2 minutes. Whisk in the garlic, Italian seasoning, salt, and pepper for one minute. Whisk in the parmesan cheese until melted. Does it still taste amazing after refrigeration? Trying to make a larger quantity for a big family reunion this summer. This is a sauce that rivals the nicest Italian restaurants recipe. A friend of my daughter proclaimed she didn’t like “white” sauce so she would just eat noodles plain. I talked her into trying a taste on a spoon from the pot and she couldn’t get enough afterwards. Super easy, amazing turnout – you can even substitue heavy cream for milk and tbe sauce still tastes incredible and rich! My husband and I love this recipe! 5/5 stars!! Will half and half work as good as whipping cream? It should work fine, might not be quite as thick. I didn’t have quite enough parmesean so I added 2 oz cream cheese as well… OMG this IS AMAZING! Hi…this sounds delicious and simple. I’m looking for a recipe that I can use for meal planning for me and my daughter, as I dislike the funky, processed taste of jarred sauces. Will this hold up well in the fridge for a few days/week? This was soooooo good! I added prociutto and mushroom to mine, and it was awesome! Will be making again soon! This sauce was easy and so fresh tasting ! Will be my go to Alfredo sauce. Best recipe ever. My family loved it. Will be making this a lot!!! I like to use Brie in mine to thicken it. Melt the brie and cream, add butter and garlic and pepper. when its all creamy but still thin, add the parmesan. Oh my goodness! This was the best Alfredo I have ever had. I had the hungry grandkids, was in a hurry and didn’t have the type of Parmesan that was required in the recipe. I used the shaker, already grated Parmesan. It was still glorious! Everyone loved it, even Henri, my pasta gourmet. For me, it was infinitely better than restaurant Alfredo. We used Linguini. Perfezionare! Grazie! This is by far the best alfredo sauce I’ve ever made. My mother use to make the best at her Italian restaurant . This recipe is 100% on point like my mother’s. And super easy . I did not add any salt . Butter and parmesan had plenty . I grilled shrimp and put it in the sauce with fresh broccoli. I Made this recipe and it was a great success . I am wondering if you could freeze it. Hi! Glad you liked it! You could try freezing it if you’d like. But, I have to say I’ve never had great luck freezing cream-based sauces like this, the texture just isn’t the same after. Do you know how much pasta this will work for? This recipe is absolutely delicious! I will never try another. ? I literally made this on a 30 min lunch break and it came out fabulous. My family has been making alfredo sauce from scratch for over a year now and we appreciate quick and easy recipes. Thank you so much! 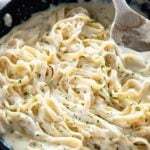 Awesome Alfredo sauce the best yet I ever tasted and I get control the sodium just love it. Used 1 cup cheddar in a double recipe, also used 1 T of rosted garlic, Italian spice rosted tomato oil with the butter. Added a handful of bacon at the end and OMG THIS WAS AMAZING! I even got my partner to eat spaghetti squash with this sauce on top!